Adding a natural, homespun look and feel is this Fall Wood Crate Display at Bath & Body Works. Slatted bottoms create additional depth, dimension, and detail compared to full flat bottom construction. Face up, forward or backward to create merchandising pedestals for a larger display. And don’t forget you can place upward facing and use as a bulk bin too. Add this wood crate outfitting concept to your use of Bushels, Baskets, Pecks and Pails for more variety. 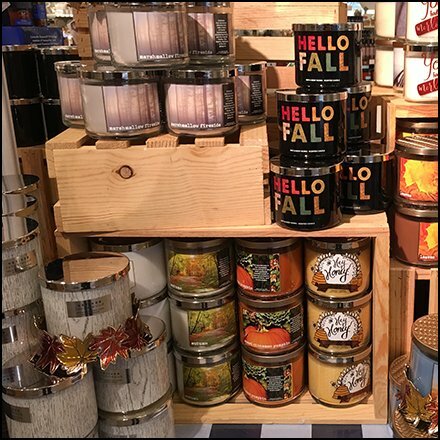 This Fall Wood Crate Display at Bath & Body Works seen at the Wyoming Valley Mall.